Canon Pixma MG6853 slightly goes out of the Canon range to offer a creamy white finish to the home users. The machine is a 5-ink all-in-one inkjet that prints, copies and scans smartly while offering WiFi Direct. As far as the weight and dimensions are concerned, it is 6.4 kg and 45.5 x 36.9 x 14.8 cm (WxDxH), respectively. With this, the device can be easily stored in a closet. A large 7.5-inch colour touchscreen and user-friendly control panel make the multifunction job easier. The device enables you to print straightaway from a smartphone or tablet with a resolution of up to 4800 dpi. You can even print impressive quality photos stored in memory cards or digital camera speed up to 15 ppm for mono and 9.7 ppm for colour. Additionally, Canon Pixma MG6853 Ink Cartridges backed by Canon’s FINE technology further enhance quality. The three-in-one machine is compatible with some of the versions of Windows and Mac OS. Canon Pixma MG6853 offers more than just printing, scanning and copying. It stands out from other same range printers due to Canon Pixma MG6853 Ink Cartridges that are available in 5 colours with the fifth being pigment black which is primarily added to provide crisp and sharp quality output. The inkjet multifunction printer is apt for home users who would like to print photos and text directly from Cloud and smart mobile devices. But does not fit the requirements of business users. How to save the colour Canon Pixma MG6853 ink cartridges, while the need is of monochrome prints? During the printing process, colour ink cartridges are also included for monochrome prints. The device offers full-colour printing due to the default setting in the printer driver window i.e. colour. Therefore, the machine will automatically mix the colours from Canon Pixma MG6853 ink cartridges to produce a selected colour (including the black colour printing). Note: The screens may differ. It depends on the operating system and also on the Brother machine you are using. Step 1: Select the start menu and open control panel. Step 2: Select devices and printers. In that menu, search for your printer model and right-click to open printer properties. Step 3: In the printing preference tab, click the advanced tab. Step 4: Change the colour/grayscale settings to grayscale. Step 5: Now further open basic tab and choose plain paper as the media type. Before that, make sure that the Slow Drying Paper is unchecked. Step 1: In the main menu, select system and preferences and then view printer and scanners (or print, scan & fax). Step 2: In that look for your printer. Step 3: Right-click to view print dialogue box (i.e. printer driver window). Step 4: Select the printer setting in the print dialogue box. Step 5: Change the media type to plain paper and ensure that the Slow Drying Paper is not ticked. Step 6: Also, change Color/Grayscale setting to grayscale. In case, you are not satisfied with the print quality, you can open the printer driver window and reset the settings to default settings. Q. Will I notice a decline in the print quality when using your compatible Canon Pixma MG6853 ink cartridges with my printer? A. Absolutely not! Our compatible ink cartridges contain premium ink, that will provide the user with the same print results as the original ink cartridges. Even though our compatible ink cartridges are cheaper, we do not compromise on ink quality and provide our customers with high-quality ink cartridges. Q. How many pages can compatible Canon Pixma MG6853 ink cartridges print before they get empty? A. The compatible Canon Pixma MG6853 ink cartridges that we provide are XL ink cartridges that have a higher page yield as compared to the standard MG6853 ink cartridges. The black pigment ink cartridge (PGI-570XL) can print up to 500 pages before requiring replacement, the black dye ink cartridge (CL-571XL) can print around 895 pages before getting exhausted. The coloured ink cartridges are capable of printing around 650 - 680 pages each. Q. Do Canon Pixma MG6853 printers come with a duplexer? A. Yes, Canon Pixma MG6853 printers come with an automatic duplexer, which is capable of printing on both sides of the paper without requiring any manual efforts from the user. This is a convenient feature for users and, saves time and effort. Q. What is PIXMA Cloud Link? A. Canon Pixma MG6853 printers are equipped with the PIXMA Cloud Link feature, that allows you to print images or documents from various social networking or cloud storage websites over the internet, without requiring a computer. Some such websites are Facebook, Instagram, Dropbox and Google Drive etc. Q. What are the different interfaces that come with this printer? A. There are various interfaces you can use to connect your device and print pages with a Canon Pixma MG6853 printer. This printer has a USB port and Wi-Fi connectivity to connect with computers. 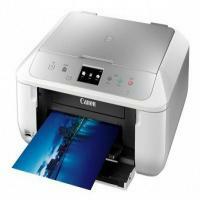 You can also use Canon PRINT Inkjet/SELPHY app, Canon Print Service Plugin (Android), Google Cloud Print, Apple AirPrint, Wi-Fi Direct, WLAN PictBridge, Memory Card Slots, Mopria (Android) to connect mobile devices. Q. Is it harmful for my Canon Pixma MG6853 printer to use compatible ink cartridges along with originals? A. Absolutely not! You will not face any trouble while using our compatible Canon Pixma MG6853 ink cartridges along with original ink cartridges. Your printer will function normally and provide you with good print results.